Choke is the common name for an obstruction of the oesophagus of a horse. 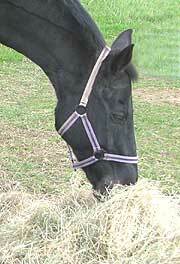 One of the key features of equine choke is the appearance of food materials at the horse's nostrils. This is beacause the arrangement of the palate prevents food that is regurgitated from re-entering the horse or pony's mouth. A prolonged episode of choke can cause scar tissue in the oesophagus and pneumonia can occur as a result of fluid or feed getting into the lungs during an attack. What causes Choke in a horse? Although the muscles in a horse's gullet are strong, their strength is not limitless. A greedy pony or horse may get Choke when he gulps down a large mouthful of dry hay, sugar beet, pony nuts, carrots or other dry and absorbent food. The waves of contraction in the muscular wall of the horses's oesophagus may only succeed in carrying the food down part way. The contractions may run out of steam somewhere in the lower neck or chest of the horse. Another swallow will simply pile up more of the food at the site of the blockage. Once the process has been clogged up the jammed mass of food material will soak up the lubricating secretions from the lining of the horse's oesophagus. Then the gullet will become dry and thoroughly impacted. Violent coughing, retching and gasping. Sometimes the horse may appear to have colic. The horse may blow out feed through his nose and mouth . The horse or pony will become depressed and stand about with food debris and saliva coming out of his nostrils each time that he swallows. Although many cases of choke will clear by themselves this IS a medical emergency so call your vet immediately you see these symptoms. If the choke has not cleared by the time he arrives the vet will insert a stomach tube and gently flush the oesophagus until the blackage is washed away - this may take some time. Some horses need to be sedated to encourage relaxation of the muscles which may be clamped tightly around the blocked segment. In very bad cases surgery may be necessary under general anaesthetic. An incision may be made into the oesophagus to remove the blockage or the pressure of a hose pipe may be used to wash out the obstruction. Follow up treatment includes relaxant drugs and antibiotics as bruising and ulceration of the oesophagus is common - nevertheless cases of choke in horses carry a very good prognosis. Whilst healing the horse's diet should mainly consist of a soft gruel fed little and often. Hay and grass should be avoided.